The pepperoni roll, a soft bread roll with pepperoni baked in the middle, originated in the coal mining areas of north central West Virginia when Italian immigrants invented a food that could be eaten easily underground. This spicy snack soon found its way out of the mines and into bakeries, bread companies, restaurants, and event venues around the state, often with additional ingredients like cheese, red sauce, or peppers added to this humble food staple. 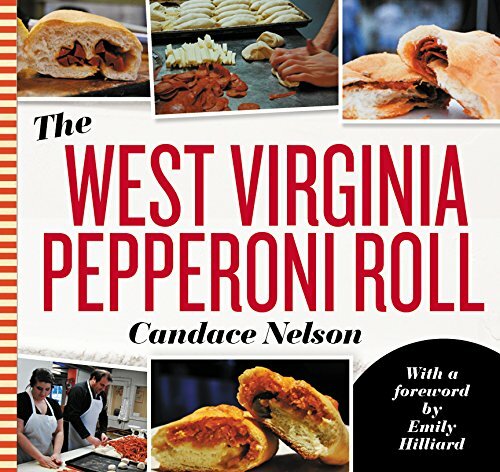 As the pepperoni roll’s reputation moves beyond the borders of West Virginia, this food continues to embody the culinary culture of its home state. It is now found at the center of bake offs, eating contests, festivals, as a gourmet item on local menus, and even on a bill in the state’s legislature. The West Virginia Pepperoni Roll is a comprehensive history of the unofficial state food of West Virginia. With over 100 photographs and countless recipes and recollections, it tells the story of the immigrants, business owners, laborers, and citizens who have developed and devoured this simple yet practical food since its invention. May 26, 2017 - Three Rivers Festival at 5 p.m. in Fairmont, W.Va.
June 3, 2017 - Apothecary Ale House & Cafe from 2 -5 p.m. in Morgantown, W.Va.
June 8, 2017 - Taste of West Virginia at the WVU Alumni Center from 5:30-8p.m. in Morgantown, W.Va.
June 10, 2017 - Weirton Book Company from 4-6 p.m. in Weirton, W.Va.
June 15, 2017 - Taylor Books from 6-7 p.m. in Charleston, W.Va.
June 17, 2017 - Barnes & Noble from 1-4 p.m. in Morgantown, W.Va.
June 20, 2017 - Rolls on the River from 5:30 - 8 p.m. in Charleston, W.Va.
June 24, 2017 - Empire Books from noon- 2p.m. in Huntington, W.Va.
July 8, 2017 - Town Run Brewing (hosted by Four Seasons Books) at 5 p.m. in Shepherdstown, W.Va.
July 13, 2017 - Upshur County Public Library from 4-5 p.m. in Buckhannon, W.Va.
July 22, 2017 - Wheeling Italian Festival from 11 a.m. to 5 p.m. in Wheeling, W.Va.
July 30, 2017 - The Great Pepperoni Roll Cook-Off at the Morgantown Market Place Pavilion from 2-4 p.m. in Morgantown, W.Va.
Sept. 2, 2017 - West Virginia Italian Heritage Festival Author Forum at noon in Clarksburg, W.Va.
Oct. 22, 2017 - Pepperoni Roll Day at the Mountainlair from 11 a.m. to 4 p.m. in Morgantown, W.Va.
Oct. 28, 2017 - West Virginia Book Festival at the Charleston Civic Center in Charleston, W.Va.
Nov. 4, 2017 - Bridgeport Public Library from 1 p.m. to 3 p.m. in Bridgeport, W.Va.
April 5, 2018 - Edgewood Summit from 7 p.m. to 8 p.m. in Charleston, W.Va.
Aug. 5, 2018 - 4th Annual Great Pepperoni Roll Cook Off from 2 p.m. to 4 p.m. in Morgantown, W.Va.
Sept. 9, 2018 - Rolls on the River from 3 p.m. to 6 p.m. in Charleston, W.Va.
Oct. 21, 2018 - Pepperoni Roll Day as part of Mountaineer Week at the Mountainlair from 1 p.m. to 3 p.m. in Morgantown, W.Va.
Jan. 10, 2019 - Book reading at Cicada Books at 6 p.m. in Huntington, W.Va.
June 22, 2019 - 12th Annual BBQ Bash & Pepperoni Roll Bake-Off at The Citadel Holliday Alumni Center at 1 p.m. in Charleston, S.C.